I’ve taught digital citizenship lessons to students for years. We talk about copyright, Creative Commons, citing the works of others, and giving credit where credit is due. I’m pretty confident that my former students are cognizant of these concepts as digital citizens. It’s important to have these conversations (I won’t call them lessons) with educators, too. Teachers need to model these concepts within their own lessons and their practices. It’s a common pitfall in the busy lives of educators to quickly grab an image, borrow a quote, or even use an idea without stopping to name the source. I think it’s a discussion we should just be having more often. Let’s think about those three words in the title. Innovate. Emulate. Replicate. As educators, there are times that we use all three, but two of these require some sort of attribution. I’m using myself as an example. When I’m innovative, the idea is my own creation. I don’t need to cite or credit anyone of course, because the innovation was unique. However, and those of you who truly innovate will understand, we expect others to be good digital citizens when they use, share, emulate, or duplicate our work. 1) If you learned something new from someone and then you use it or present it, give ’em credit! 2) If you create something unique that was based on the work or idea of another (you tweaked it), give ’em credit! There are lots of folks that I emulate. I created a Digital Badge system for professional development in my district. I’m proud of it, but the idea was tweaked from lessons I learned from the amazing Laura Fleming (@LFlemingEDU). When I travel and do presentations about my digital badging system, I ALWAYS mention that I got the original idea from Laura. Every. Single. Time. Anyone who has ever been to my sessions can attest to it. She’s not literally cited on my website, but if I present or share and people like my system, it’s so important that I let them know that it was based on the innovative work of Laura. Similarly, I created a really cool, unique Makerspace in my school. I EMULATED the ideas of a genius friend of mine named Meredith Martin (@geekyteach). My model looks very much different than hers now, but I LEARNED the ideas from her that got me started, so her name is a regular part of my Makerspace presentation. Two years later. Every. Single. Time. Let’s talk about duplication. We all do that, too, from time to time. 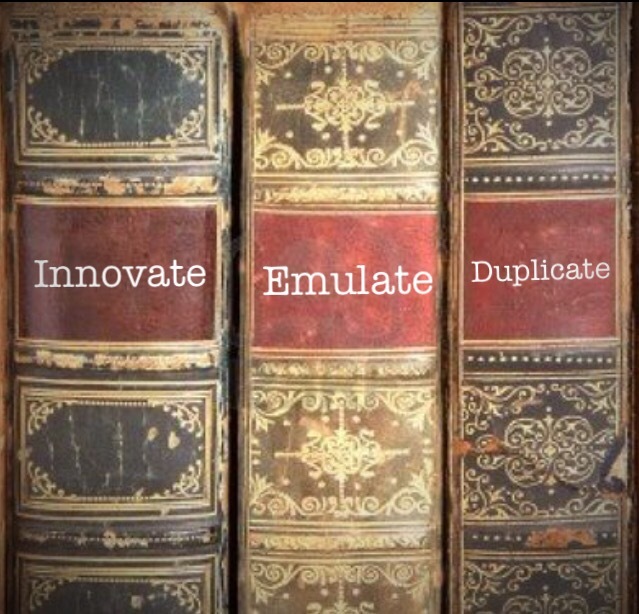 We use an exact copy, a replica, a duplicate of someone else’s work. There’s nothing wrong with it. As a matter of fact, it’s often a great time saver & gives us access to unique new tools, sites, activities, and ideas. Over the past several weeks, I’ve received numerous messages from excellent digital citizens who were asking permission from me. They wanted to use an infographic that I had created called, “What is A Technology Integration Specialist?” Although my work isn’t copyrighted, those asking permission did the right thing. They wanted to use my exact presentation to present to their own districts. Duplication is cool, but asking first is the rule. My hope in writing this post was to bring more awareness to the issue for educators. I’m hoping that if you mention this post to some colleagues, share it at a faculty meeting, or print it out & leave it in the teacher lunchroom, that it will be a great reminder of our obligation to be role models for our students when it comes to citation and attribution. Oh, and next time your students are doing some presentations for class, spend some time reminding them, too. We all could benefit from having a reminder from time to time.